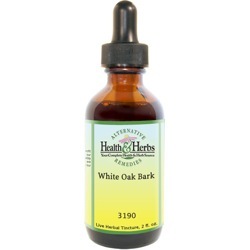 White Oak Bark is a powerful astringent that has been used for centuries to control diarrhea, internal and external bleeding, excessive menstrual flow, nosebleeds, and hemorrhoids. It is also a potent antiseptic that has helped to control bacterial invasion and infection and has been employed to relieve vaginal and bladder infections, among others. White Oak Bark (the inner bark) is a powerful astringent it one of the most potent treatments, that has been used internally and externally for centuries to relieve diarrhea, hemorrhoids, vaginal discharge, vomiting, nosebleeds, womb troubles and dysentery. The astringency is also effective in cases of excessive menstrual flow and hemorrhages, including hemorrhaging of the lungs, bowels, stomach, and spitting of blood. As a diuretic that increases the flow of urine, White Oak Bark helps to expel mucous discharge, flush out kidney stones and gallstones, and improve the health of the bladder. It is also said to be helpful for ulcerated bladder or bloody urine. Furthermore, White Oak is believed to normalize the function of the kidney, liver, and spleen and has been used to relieve jaundice and other liver ailments. As an antiseptic and parasiticide agent, it destroys and expels worms (including pinworms) and other parasites from the intestinal tract. Ingredients: White Oak Bark, Structured Water, 20% Alcohol. Non-Alcohol: White Oak Bark, Structured Water, Vegetable Glycerin. Contraindications: Currently, there are no known warnings about the use of White Oak Bark; however, it should be noted that prolonged use of astringents is not recommended.